Estar group provides you with cloud booking management systems. 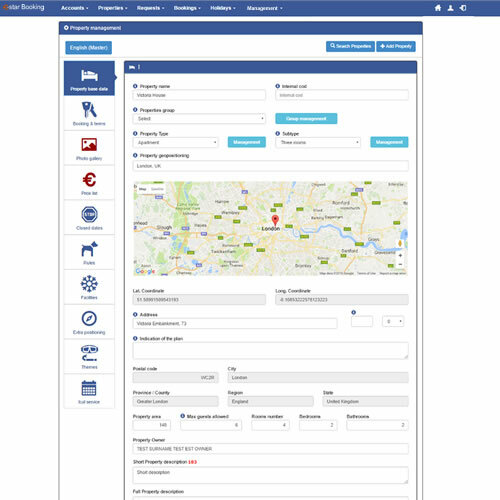 Estar Booking applications give you the opportunity to manage properties, price lists, promotions, options, bookings, customers, agencies, from property information set up to web site engine connection, XML API services, OTA Channel connections, Channel managers connection, and everything you need to handle your bookings. Estar Booking Alpha solution is a Professional cloud application, dedicated to Property Managers, Agencies, Tour Operator and vacation newtworks. Alpha is one of the Estar Booking applications, dedicated to properties and bookings management. 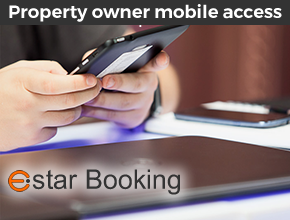 Estar booking application series is dedicated to Vacation rental booking and management purposes. The main advantage is that you can use it via a standard browser where you are connected. The others relevant features are that the solutions are a full stack service. You have your own PMS solution, you can use a full API XML service for your agencies, or website. You can integrate via a one line code a booking engine search bar, in your website, or you can alternatively use the Booking Engine API XML calls to completely integrate your information with your CSS and pages. 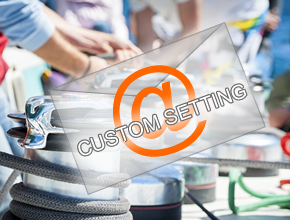 You can also connect a channel manager service (Mybookingpal, Rentals United, Octorate), or you can connect the main 5 single channels such us Booking.com, Expedia, Flipkey, or Atraveo. If you don't want to activate any channel you could also use the Estar native iCal out property URL function, that shows a real time availability flow for each item, to connect via iCal standard to an OTA availability update service. (you can activate one URL for every single agency you would like to connect, via the dedicated module). Estar Alpha is the Estar main international cloud software for Property Managers and Agencies target. 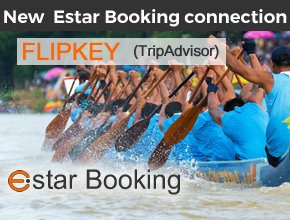 Estar group has several other Booking management solutions dedicated also to Enterprise vacation rentals company. The included dynamic vacations planner service, permits you to show bookings on the background available periods. It shows green instant booking periods, or yellow on request availabilities. Also useful is are the closed dates layer which permits you to check wich dates are not still available because they have been closed by the management module. The bookings are shown in different colours depending on their state (option, confirmed bookings, check in, after check out etc.). With these functions you have an online real time view of your availabilities and bookings. All this information is also at your disposal via the booking listing functions, or the other several menu items available. 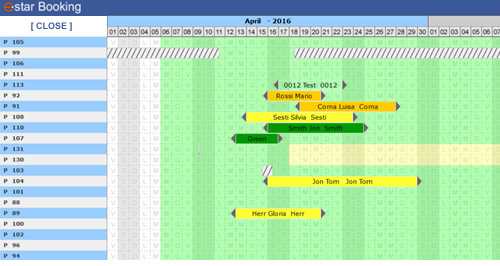 You can insert booking also manually directly from the planner module. The planner module interacts with the Property management, Promotions, Agencies, Guest and Financial modules.